June is one of the best months for gardens in St. Louis. The weather isn't too hot yet (except for this year, which has been really too warm), there's plenty of rain, and everything is lush and green. 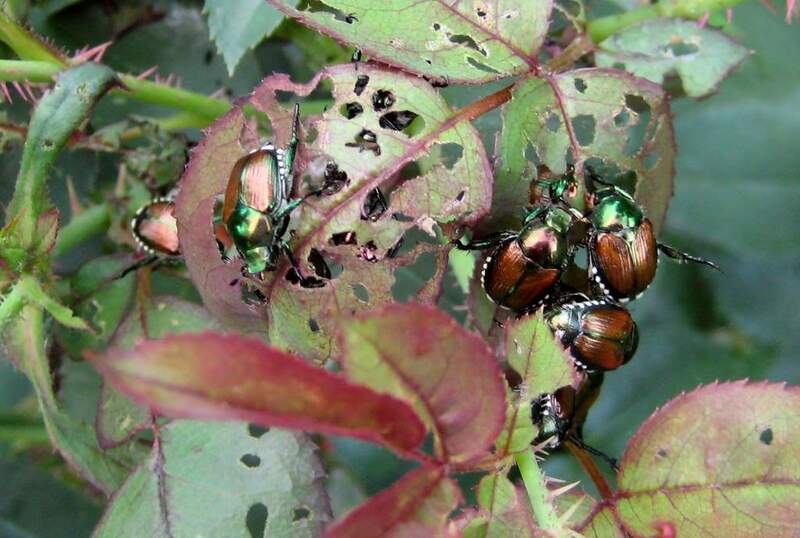 Unfortunately, it's also the time that the Japanese Beetles make their appearance. As beautiful as they are with their metallic-looking exoskeletons, they are not welcome. If you happen to be growing a plant that they like to eat, be ready for a swarm. 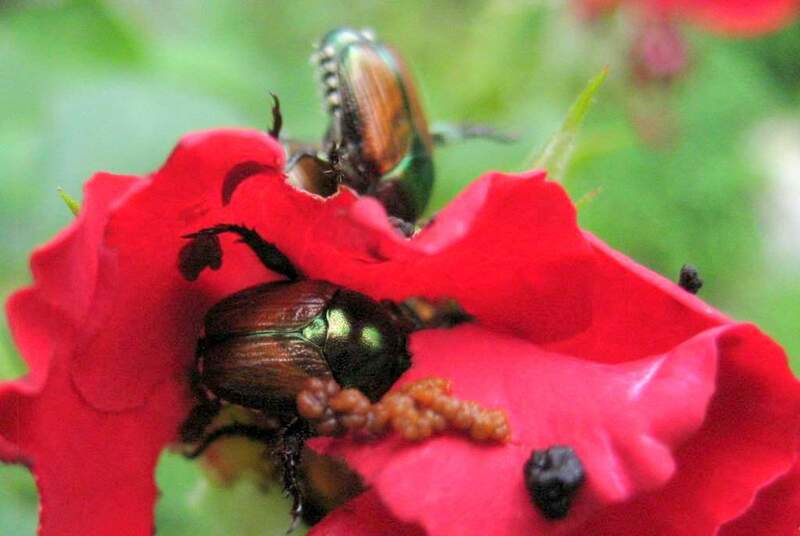 In my garden they love the roses. They like the flower petals best, but have appetites for the leaves as well. They can do a lot of damage quite quickly, mainly because of their numbers. 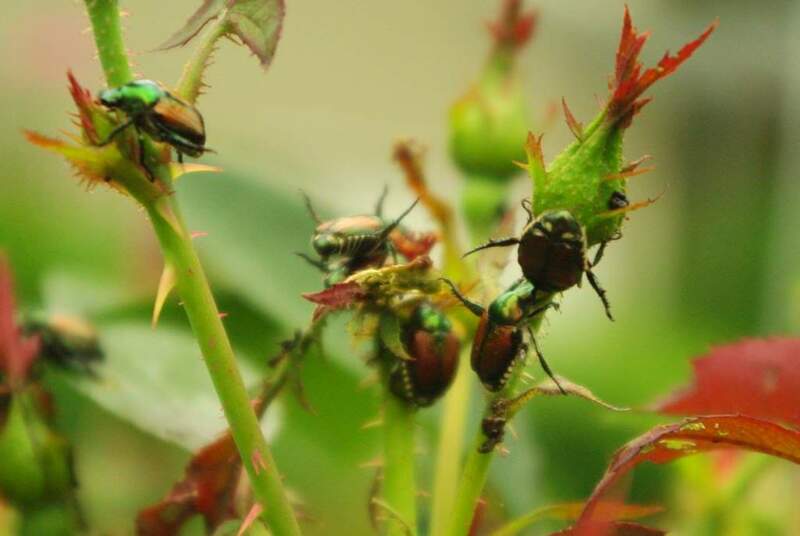 We're not talking sky-darkening swarms, but a few dozen beetles on a rosebush can be a problem. 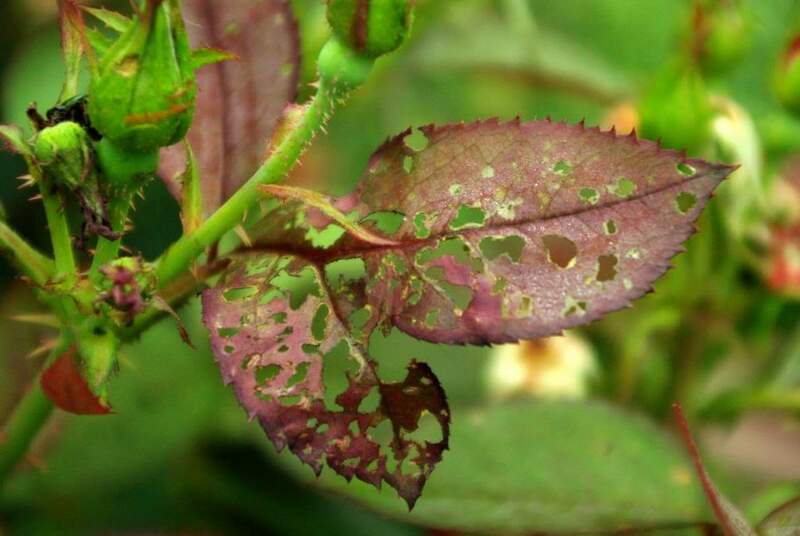 Flowers and leaves will be damaged extensively in just one day, or even a few hours. 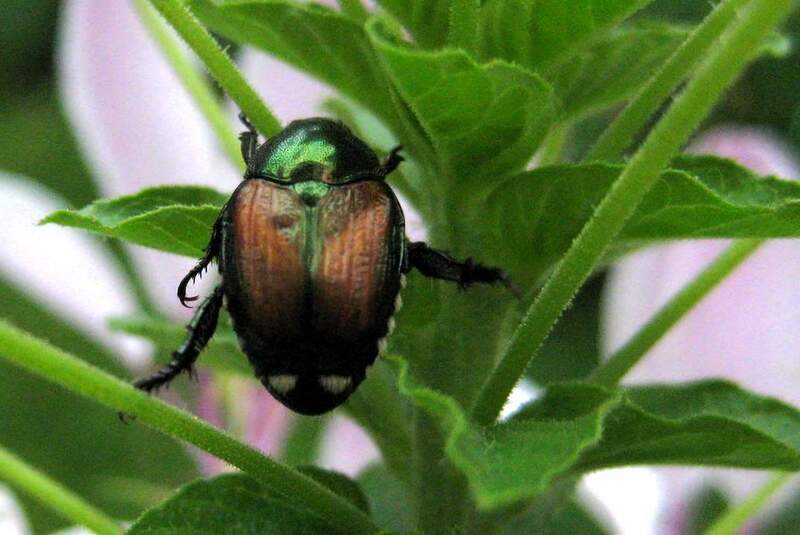 My next-door neighbor doesn't grow roses, but he has a young American Linden tree that the beetles just devour. The tree is small, but tall enough that you can't get at the beetles, and all of the leaves end up looking like lace. The tree is hanging in there though. ...then you've got a potent weapon against them. 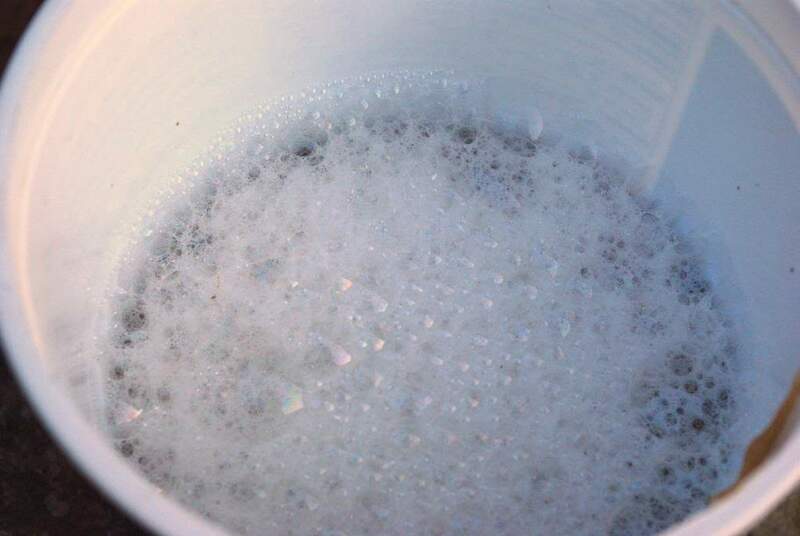 No, it's not a foamy cup of beer (although that might help some days) -- it's soapy water. Hold the bucket below the beetles, tap them or the branch they're on, and they fall right into the suds. They are unable to climb out, so they drown. It's best to do this in the morning while the beetles are sluggish. Later in the day they're too quick and you won't get nearly as many into the bucket. Interesting fact: if you leave a bucket of beetles in soapy water out on the deck overnight, something (raccoons I think) will eat all of the beetle carcasses. Apparently they like the taste of the beetles much more than they dislike the taste of the soap. In the end though, the only thing that really stops the attack of the Japanese beetles is the calendar. After about a month all of the beetles are gone, and we're safe until next June. 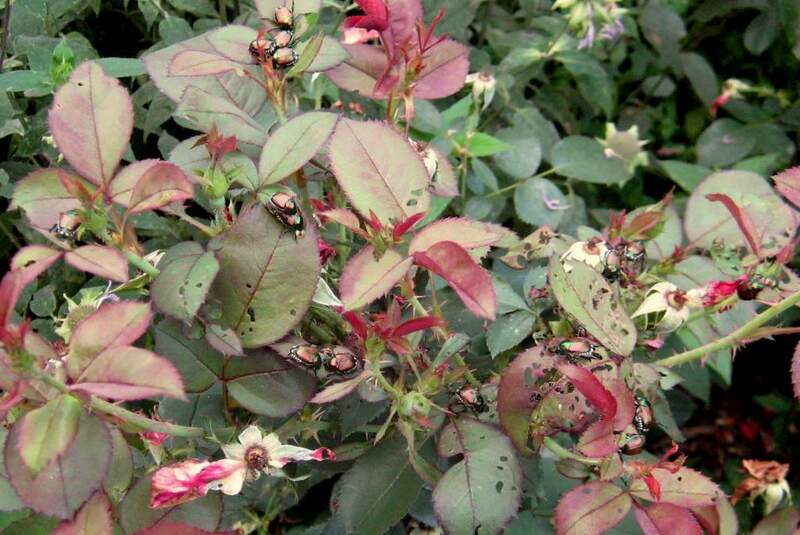 That gives the roses plenty of time to recover and bloom virtually care-free for the rest of the summer. Well, except for the deer that keep munching on them that is.